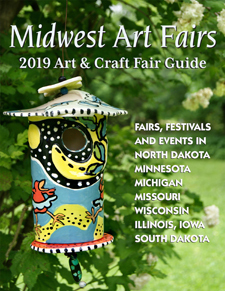 Midwest Art Fairs is your regional guide to art and craft fairs, festivals, and events in the Upper Midwest – Minnesota, Wisconsin, Iowa, North & South Dakota, and Illinois. Search by date or location using the Event Search tool. Or scroll through the list of Upcoming Events and click on the dates highlighted in red. A brief description of each event appears after the date and location. For more details including booth fees, application deadlines, show guidelines, attendance figures, number of vendors, names of promoters or sponsoring organizations, addresses, phone numbers, email and website links, and other important contact information, click on Subscribe. To place a listing for an event or to advertise your business or event in Midwest Art Fairs, click on List an Event or Advertise.